How Can a Prenuptial Agreement Protect your Marriage? | The Ashmore Law Firm, P.C. How Can a Prenuptial Agreement Protect your Marriage? A prenuptial agreement in Texas can also be used to clarify financial responsibilities during the marriage. These responsibilities include the filing of taxes, payment of household bills, maintenance and ownership of checking and savings accounts, payment of credit card charges, responsibility for large purchases, estate planning and payment of support and education costs. 1. You have children from a previous marriage: If you have children from a previous marriage, you probably have support obligations. A prenuptial agreement ensures that your assets are protected for the children of both marriages in the case of a divorce or death. Many agreements contain clauses which state that the agreement will not be valid after a certain amount of years, so if you are supporting children from a previous marriage, you may cancel the prenuptial agreement in Texas after the children are grown. 2. You own a business: If you own a business and your marriage ends, it is possible that your spouse may end up owning part of the business. You can protect your business and financial partners with a prenuptial agreement. 3. You or your partner have significant debt: If you have a high debt load, a prenuptial agreement can protect your spouse and community property from your debts. If your partner has a large amount of debt, it also protects you from being responsible for those debts if the marriage ends. 4. You have property that you would like to remain in the family: A prenuptial agreement can ensure that certain family property or heirlooms remain in your family after your death or a divorce. 5. You have inherited wealth or earn a lot more than your partner: A prenuptial agreement can be used to limit the amount you will pay in spousal support (alimony) if the marriage ends. It ensures that your spouse is marrying you for love rather than money. 6. You earn a lot less than your partner: Just as a prenuptial agreement can protect a spouse with more money, it can also be used to ensure spousal support of the person with less income. 7. You plan to quit your job to raise children: Quitting your job to raise children affects both your current income and your future earning potential. This agreement can ensure that the financial cost of raising children is shared equitably by both parents and that the parent who gives up working is supported if the marriage ends. Communicating about financial matters and creating a prenuptial agreement in Texas together can strengthen a relationship and provide a strong base for future financial dealings. If you are getting married, we wishe you a long and happy future together. 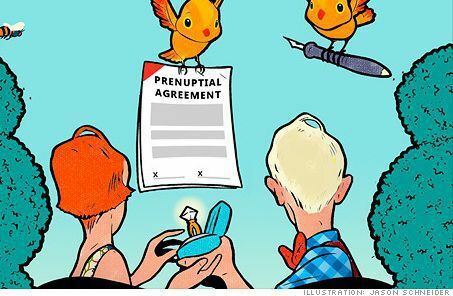 A prenuptial agreement can help protect this future! Want more information? Request our free book.